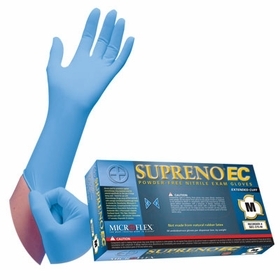 Supreno EC Powder-Free Gloves Supreno EC is a soft and durable nitrile examination glove made for high-risk applications. Designed to perform like a strong, thin second skin. Won't fatigue hands over long periods of wear. Improved elasticity for greater comfort. Eliminates the potential for latex protein sensitivity. Reliable grip. Increased durability. Thicker fingertip protection. Greater tactile sensitivity. Added protection over the wrist and arm. Powder-free manufacturing process with interior polymar coating. Fully textured with an exterior polymer wash. Exceeds all current and proposed FDA and ASTM synthetic glove standards. Gradient dipped.